Download "New Tracks in B.S. in Mathematics"
1 New Tracks in B.S. 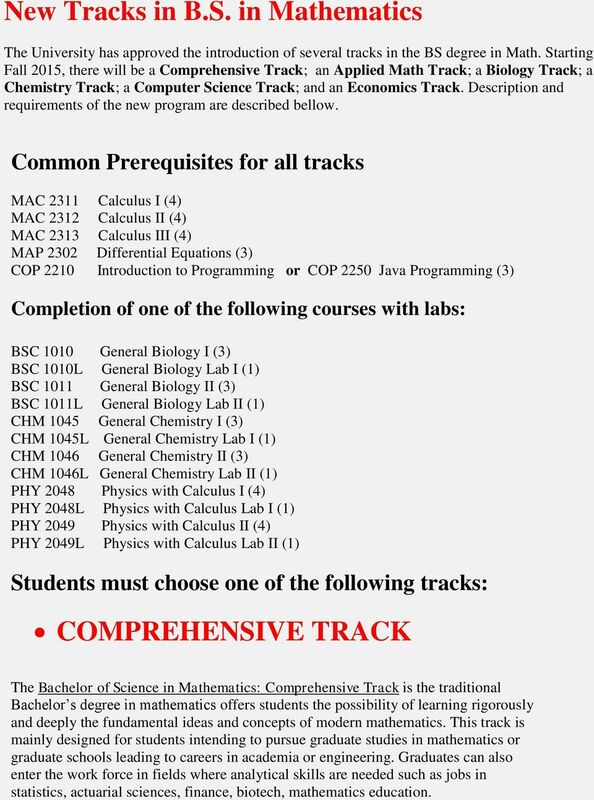 in Mathematics The University has approved the introduction of several tracks in the BS degree in Math. 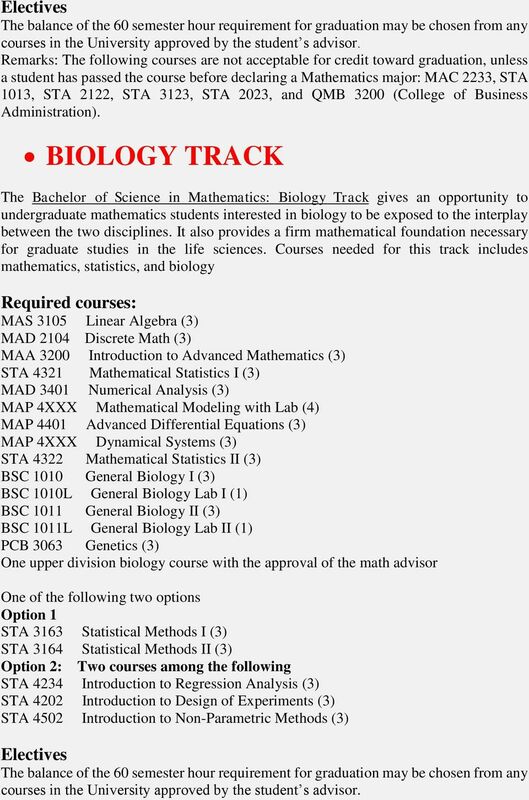 Starting Fall 2015, there will be a Comprehensive Track; an Applied Math Track; a Biology Track; a Chemistry Track; a Computer Science Track; and an Economics Track. Description and requirements of the new program are described bellow. 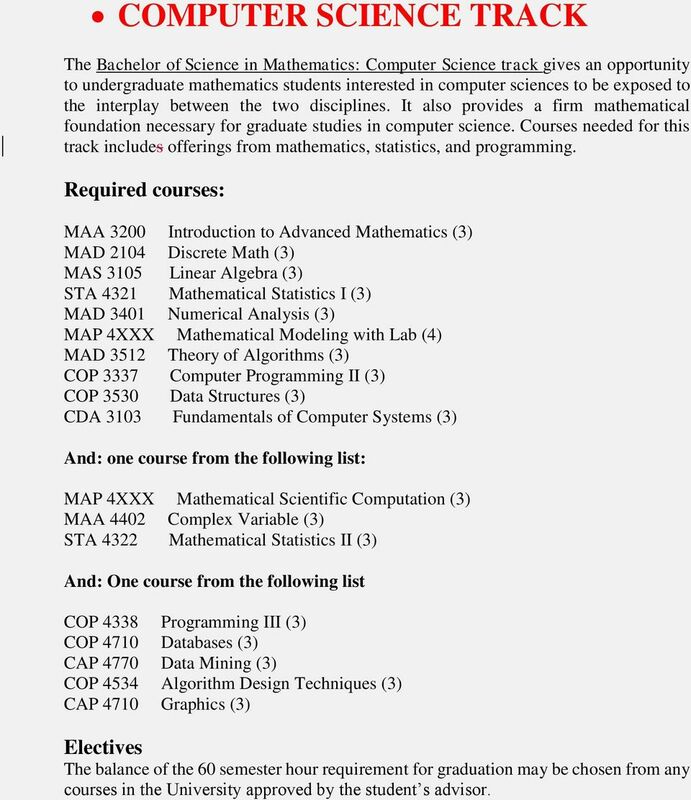 Common Prerequisites for all tracks MAC 2311 Calculus I (4) MAC 2312 Calculus II (4) MAC 2313 Calculus III (4) MAP 2302 Differential Equations (3) COP 2210 Introduction to Programming or COP 2250 Java Programming (3) Completion of one of the following courses with labs: BSC 1010 General Biology I (3) BSC 1010L General Biology Lab I (1) BSC 1011 General Biology II (3) BSC 1011L General Biology Lab II (1) CHM 1045 General Chemistry I (3) CHM 1045L General Chemistry Lab I (1) CHM 1046 General Chemistry II (3) CHM 1046L General Chemistry Lab II (1) PHY 2048 Physics with Calculus I (4) PHY 2048L Physics with Calculus Lab I (1) PHY 2049 Physics with Calculus II (4) PHY 2049L Physics with Calculus Lab II (1) Students must choose one of the following tracks: COMPREHENSIVE TRACK The Bachelor of Science in Mathematics: Comprehensive Track is the traditional Bachelor s degree in mathematics offers students the possibility of learning rigorously and deeply the fundamental ideas and concepts of modern mathematics. This track is mainly designed for students intending to pursue graduate studies in mathematics or graduate schools leading to careers in academia or engineering. Graduates can also enter the work force in fields where analytical skills are needed such as jobs in statistics, actuarial sciences, finance, biotech, mathematics education. 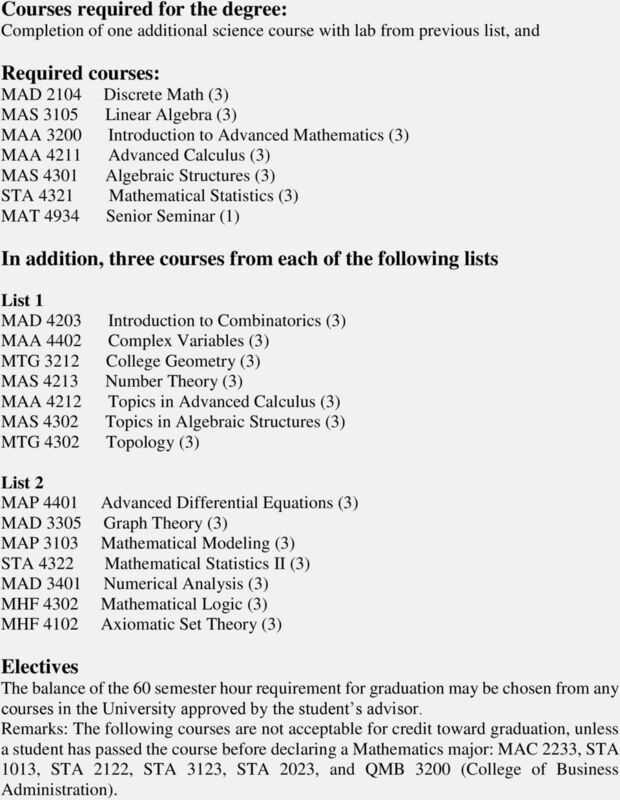 2 Courses required for the degree: Completion of one additional science course with lab from previous list, and MAA 4211 Advanced Calculus (3) MAS 4301 Algebraic Structures (3) STA 4321 Mathematical Statistics (3) MAT 4934 Senior Seminar (1) In addition, three courses from each of the following lists List 1 MAD 4203 Introduction to Combinatorics (3) MAA 4402 Complex Variables (3) MTG 3212 College Geometry (3) MAS 4213 Number Theory (3) MAA 4212 Topics in Advanced Calculus (3) MAS 4302 Topics in Algebraic Structures (3) MTG 4302 Topology (3) List 2 MAD 3305 Graph Theory (3) MAP 3103 Mathematical Modeling (3) MHF 4302 Mathematical Logic (3) MHF 4102 Axiomatic Set Theory (3) Remarks: The following courses are not acceptable for credit toward graduation, unless a student has passed the course before declaring a Mathematics major: MAC 2233, STA 1013, STA 2122, STA 3123, STA 2023, and QMB 3200 (College of Business Administration). 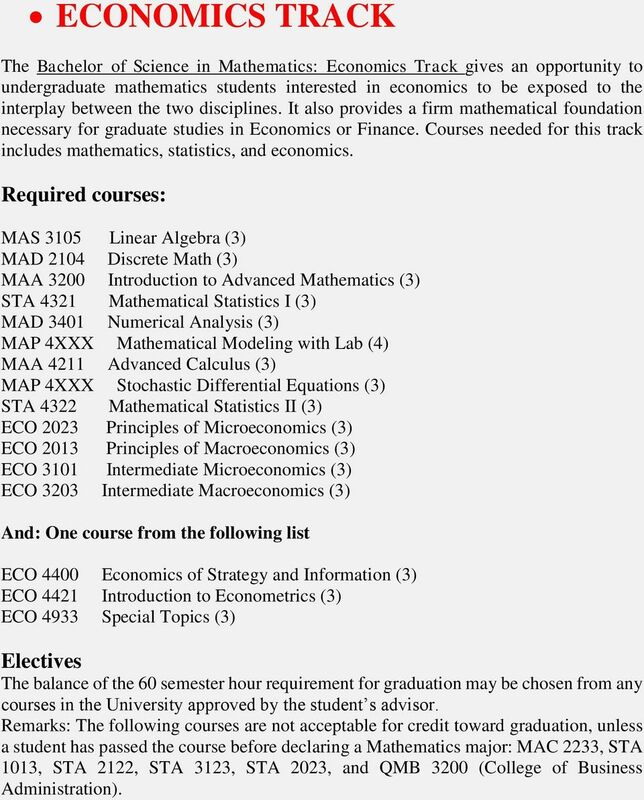 7 ECONOMICS TRACK The Bachelor of Science in Mathematics: Economics Track gives an opportunity to undergraduate mathematics students interested in economics to be exposed to the interplay between the two disciplines. It also provides a firm mathematical foundation necessary for graduate studies in Economics or Finance. 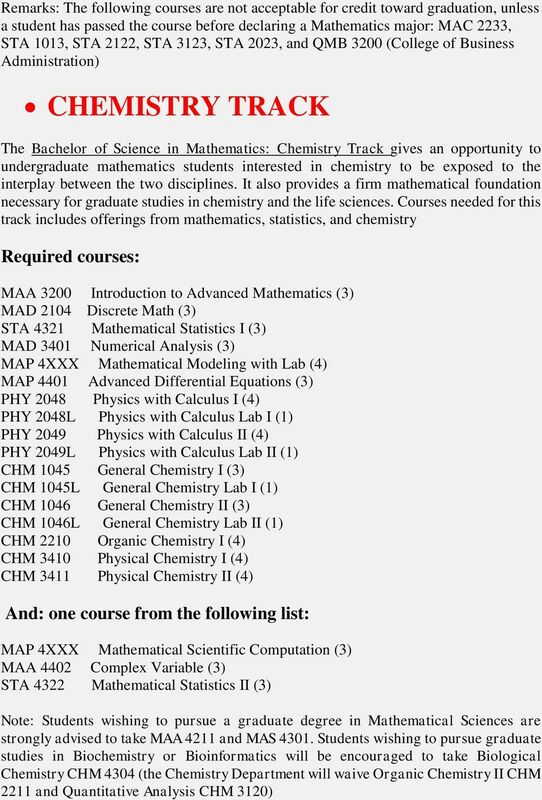 Courses needed for this track includes mathematics, statistics, and economics. 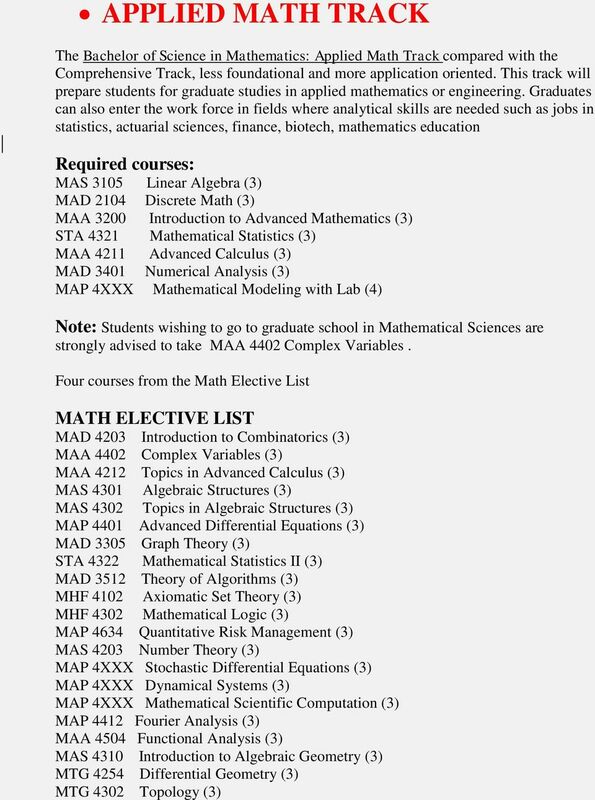 MAA 4211 Advanced Calculus (3) MAP 4XXX Stochastic Differential Equations (3) ECO 2023 Principles of Microeconomics (3) ECO 2013 Principles of Macroeconomics (3) ECO 3101 Intermediate Microeconomics (3) ECO 3203 Intermediate Macroeconomics (3) And: One course from the following list ECO 4400 Economics of Strategy and Information (3) ECO 4421 Introduction to Econometrics (3) ECO 4933 Special Topics (3) Remarks: The following courses are not acceptable for credit toward graduation, unless a student has passed the course before declaring a Mathematics major: MAC 2233, STA 1013, STA 2122, STA 3123, STA 2023, and QMB 3200 (College of Business Administration). The following proposal and its associated policy exceptions is submitted for consideration and approval by the Graduate Council and administration of Missouri Western State University Submitted by: Dr.
C-. If these courses have not been completed satisfactorily upon enrolling at USF Sarasota-Manatee, they must be taken before the degree is granted.